We are so thrilled to have our friend, Giselle Shardlow with us today to share an awesome animal yoga sequence for kids! Little ones will learn all about jungle animals – how they look, how they move, and more! Giselle is the author of Kids Yoga Stories. Her yoga books for kids get children learning, moving, and having fun. Giselle draws from her experiences as a teacher, traveler, yogi, and mom to write the yoga stories found at Kids Yoga Stories and on Amazon worldwide. 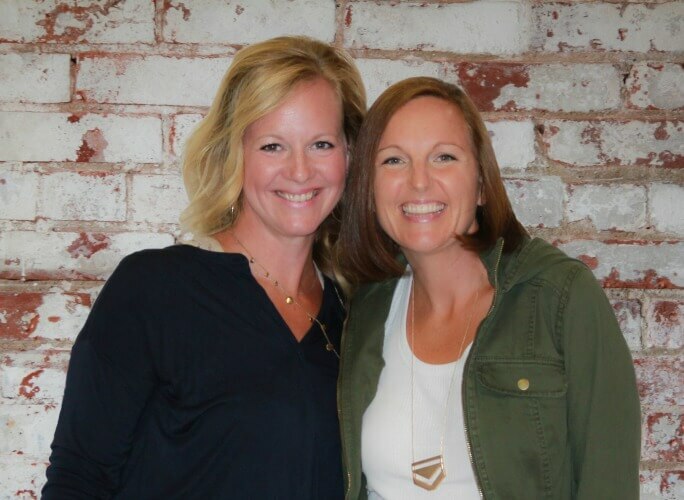 The purpose of her yoga books is to foster happy, healthy, and globally educated children. She lives in Boston with her husband and daughter. Thanks so much to Giselle for stopping by today! Hot sun. Sandy beaches. Howler monkeys. Cloud forests. Colorful birds. I have fond memories of my trip to Costa Rica years ago. And I hope to take my daughter to Central America one day, so that she, too, can experience the wonders of the jungle. Until we have the opportunity to jet set south of the border, my daughter and I learn about jungle animals by acting them out through simple yoga poses for kids. Join us! You can learn about jungle animals through movement, too! 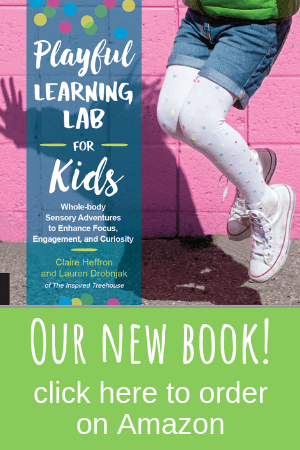 Brain research shows us that movement and pretend play stimulates the brain, thus making learning more engaging and fun. 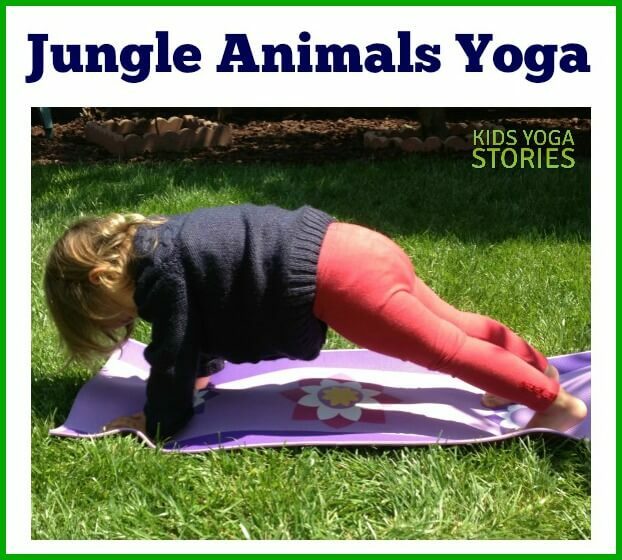 Your child will feed off your enthusiasm, so jump in and give jungle animal yoga a go! Tell your children that you are going on an imaginary journey to learn about jungle animals. Take out your favorite jungle-related books, props, music, stuffed animals, stickers, animal figurines, and puzzles. You could even dress up like your favorite jungle animal. Encourage your child’s creativity by asking how each jungle animal behaves in the wild. 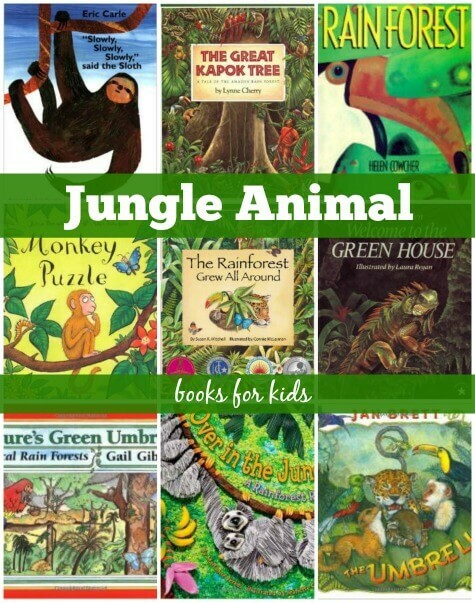 As you look through the books, make a long list of jungle animals, like crocodile, iguana, turtle, frog, macaw, quetzal, toucan, coatimundi, monkey, kinkajou, sloth, puma, tapir, anteater, armadillo, jaguar, and bat. Talk about how they move, what they eat, where they live, and what they look like. You can follow the jungle animal yoga sequence below or make up your own jungle yoga journey. Stand on one leg. Extend the other leg behind you, flexing your foot. Bend your torso forward and take your arms out to the side. Flap your arms like the wings of the macaw. Come down to a squat and tap your chest like a monkey. Step back to balance on your palms and on your bent toes, keeping your arms straight and your back long and flat. Pretend to be an alligator floating in the water. Come to lie on your tummy, place your palms flat on the floor next to your shoulders, lift your head and shoulders off ground, and hiss like a snake. Press up to an all-fours position, round your back, and tuck your chin into your chest. Pretend to be a jaguar about to pounce. Come to sitting back on your heels, slowly bring your forehead down to rest on the floor in front of your knees, place the palms of your hands flat out in front of you, and take a few deep breaths. Pretend to be a turtle looking out of his shell. Come to lie on your back with your chin tucked in, hug your knees into your chest, then grab the outer parts of your feet with both of your hands, with one foot in each hand. Pretend to be a sloth hanging out in a tree. Lie on your back with your arms and legs stretched out. Imagine listening to the sounds in the jungle. Breathe and rest. Find images of these yoga poses for kids and more, on our Yoga Poses for Kids page. Note that this yoga sequence has been laid out specifically to flow from one pose to the next in a safe, logical way. Feel free to adapt the sequence to suit the age, needs, attention span, and energy level of your child. With my preschooler, we only do 4 to 6 yoga poses at a time. You might also like our popular yoga book, Sophia’s Jungle Adventure, which was inspired by my travels to Costa Rica. Join Sophia and her family as you act out what they see and do on a jungle hike to a waterfall. This jungle yoga book is also available in English, French, Portuguese, Spanish, Russian, Chinese, and German. What is your favorite jungle animal yoga pose? Which new jungle animal did you learn about today? Share in the comments below! 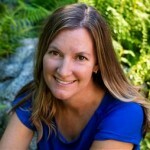 Giselle Shardlow is the author of Kids Yoga Stories. Her yoga books for kids get children learning, moving, and having fun. Giselle draws from her experiences as a teacher, traveler, yogi, and mom to write the yoga stories found at www.kidsyogastories.com/store or on Amazon (amazon.com/author/giselleshardlow) worldwide. The purpose of her yoga books is to foster happy, healthy, and globally educated children. She lives in Boston with her husband and daughter.